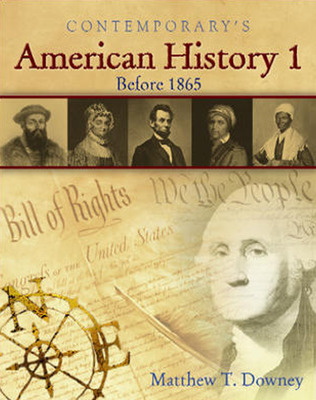 American History 1: Before 1865 covers America's story from its beginning through the end of the Civil War. 20 chapters provide information about American history from economic, geographic, political, religious, technological, social, and cultural perspectives. Audio and Interactive activities – On the student CD, full audio and interactive activities help the student better comprehend the material, improving their ability to read in the content areas. Reading support – There is extensive attention paid to helping students improve their reading ability. The readability is controlled throughout the program. Usability – The program is designed to be simple for teachers and students to use. The PDF form of all Teacher CD content makes it easy to print materials as needed. Engaging content - The series is replete with illustrations, maps, photos and timelines. Value – The program offers a complete, four color social studies curriculum at a very competitive price. Flexibility – the program can be used by a variety of student types, including Adult Ed students.